Marketing has changed radically in the past decade. Whole industries are either gone or dying primarily because of the changes brought about by the ubiquitous presence of the Internet. Another change-causing factor is that “interrupter” advertising that rules our favorite TV shows has increased from four minutes per hour in 1952 to nearly 15 minutes per hour in 2018. Because of this deluge of interruptive advertising, most of us have become quite intolerant of it all. We live in an age of easy-access information. The Internet has allowed us to get the information we want when we need it. But we want this information on our terms. We don’t appreciate being “sold” to, particularly if we’re interrupted when we’re busy or engaged in something we enjoy. This has left advertising agencies, cable and network television, radio stations, and a slew of other industries feeling the pain as customers make a mass exodus to other, less intrusive forms of entertainment. I switched to Dish satellite services from cable because I can record prime-time shows that will automatically skip commercials. I pay for Netflix because there are no commercials. I even upgraded my Pandora account to bypass music interruptions. Many of my friends and my adult children have canceled cable and satellite services completely, switching instead to services like Roku, Hulu, or Netflix, for the same reason. We also tend to ignore ads in other mediums. Studies show that in a majority of Internet searches, users skip the ads, even when they are relevant to their search request. One study shows that 40% of consumers use ad-blocking on their laptops and desktop computers. We instead click on the organic results. On web pages, studies of eye tracking show that we often skim right over ads there as well. TV ads (which most school’s can’t afford anyway), radio spots, billboards, and magazines, while quite expensive, similarly don’t give us the leads that would warrant the expense. Common sense also suggests that we seldom trust ads. They are typically companies bragging about how they are “best in class” and other such claims. Many ads are simply untrue, and I’m sure we all have had experiences to prove it. I mean, when was the last time you saw an ad where the company told you that their product or service was just mediocre? What we’ve been discussing is known as outbound marketing. It is a traditional marketing that includes any method a company uses to initiate the conversation and blast its marketing message out to an audience. Sometimes, in fact a majority of times, the audience receiving this information is not even one that is currently interested in the topic of the message. Think of it as “pushing” your message out hoping that through sheer volume it will draw some of the right customers in. Common outbound methods are sales calls, email spam, tradeshows, and advertising in its many forms (TV, radio, print, flyers, brochures, catalogs). One of the downsides of outbound marketing, besides it being expensive, is that it is difficult to measure the return on investment (ROI). It is also difficult to know if your costly outbound efforts are reaching your target audience. So, if advertising doesn’t provide the ROI that it used to, how do companies (and schools) get the word out about their services and products? The answer involves a multiple prong approach, but the good news is you don’t have to be a Fortune 500 company or a well-endowed private school to be competitive any longer. Even a small school can get in the marketing game today. Besides outbound marketing, there are other strategies for marketing your school, including pay per click (PPC), search engine optimization (SEO), blogging, social media, opt-in emails, digital marketing, and content marketing. These methods, considered inbound marketing, are also referred to as “pull” marketing because it is intended to pull customers to you when they are looking for what you offer. It involves earning their attention organically and not bugging or begging. In this blog, we’ll talk about inbound marketing (also called content marketing and digital marketing), what the benefits are, and how schools can make use of this marketing strategy to increase enrollment and establish a respected school brand. The advantages of inbound marketing are that it is typically easier to measure the results and, according to Demand Metric, content marketing costs 62% less and generates 3x more leads than outbound marketing. HubSpot’s 2018 report says that 72% of marketers say that relevant content creation was their most effective SEO tactic. In fact, HubSpot also reports that schools using inbound marketing are 7x more likely to report higher ROI than schools using outbound marketing efforts. 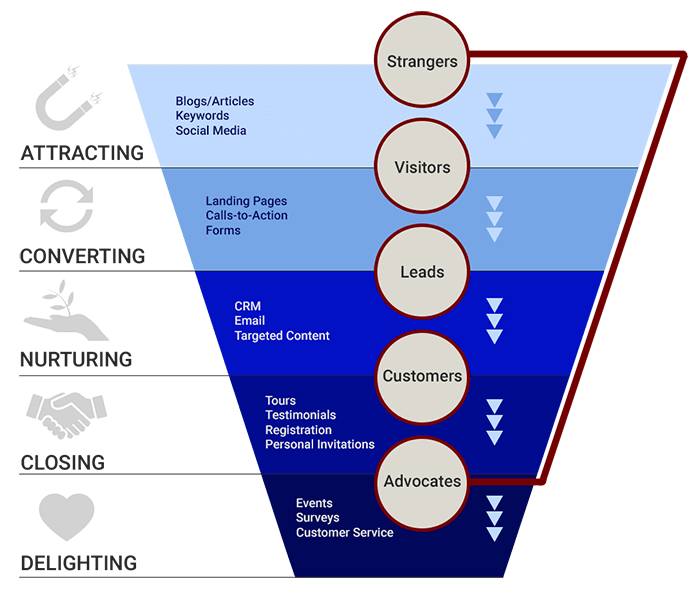 Inbound marketing is the process of attracting prospective customers to your school using content marketing in conjunction with social media marketing and search engine optimization. The goal is to create valuable experiences at each touch point, particularly your school website and blog, by providing helpful content that is relevant to those prospective customers’ needs. Attracting: Pulling in targeted visitors. You will use strategies like content marketing, social media, videos, and blogging. Converting: Turning those visitors into leads. This can be as simple as having them complete a form with their contact information to gain access to content or information they need. Nurturing: Turning those leads into customers. This requires that you nurture them as they progress through the decision-making stages. Your goal is to give the lead the necessary information to learn the facts and make a conclusion. It also needs to deliver the emotional evidence to feel you are the right choice for them. Closing: Taking the sale. If your goal is enrollment, it is when the parents complete the student application. If you are trying to attract quality staff, it is when the applicant sends you their resume. If you are looking for donations or volunteers, it is when they send you a donation or sign up as a volunteer. Delighting: Delivering on your promises. Once they are a customer, you must delight them through the services you provide, the education you deliver, and the student success they enjoy. When you do, their students will stay with you; they will refer you to their friends and neighbors, become advocates for your school, and often become alumni who donate to your school and your causes long after their children have moved on. What do you need your school inbound marketing to accomplish? To attract the right visitors to your school website (where most of your inbound marketing will play out), you need to select a purpose for the effort. You’ll want to be sure your marketing goal is a SMART goal. This stands for Specific, Measurable, Attainable, Realistic, and Timely. Most of the time, a school’s marketing efforts center around increasing enrollment or improving the quality of your applicants (attracting those ideal students or applicants). Other common inbound campaign goals are for recruiting quality staff, educating the public to pass a tax levy or bond election, or strengthening a weak school brand. What is your inbound marketing goal? Download the Goal Planning Worksheet for K–12 Schools. A persona is a composite of your existing (or ideal) customer’s characteristics. They will be the foundation for all of the content you will develop for your inbound marketing. By understanding your ideal customer’s characteristics and needs, you become the right solution—the best match for them. Create personas for your target audience. You may have more than one target, and as they have different needs, this will require different messaging. Detailing each one will let you create a personalized marketing approach. Creating a persona for each target is a common practice. If you are just getting started with inbound marketing, try to keep this step to no more than two or three personas as your primary targets. You can add others later. The personas you develop can and should be highly customized. If you are a school serving K–8 students, you will ask very different questions to flesh out your personas than if you served high school age students. This applies to private versus public, faith-based versus vocational schools, etc. You need to understand what your personas' needs are, the problems they must solve, and goals they have in mind. Basically, you want to know what job they need to hire a school to do, or maybe why they are firing their current school. Download our Persona Development Worksheet to get started. Or, check out this list of a variety of persona templates from the complex to the simple. Awareness stage: they realize they have a problem. Decision stage: they choose a solution. Delighted stage: they are your customer and are delighted with their decision. It is during the buyer’s journey that you will discover possible triggers that will push them from the awareness stage to the decision stage. A simple example might be a parent whose child will be turning five years old, and it will soon be time to register for kindergarten. Before this, they were curious about what was available, but now they must make a choice and enroll their child. Your content should include the type of information that will be that call to action to move them toward a desirable conclusion. For a more detailed explanation, use the Customer’s Journey Worksheet. Consider what parents or students would put into an online search to get the answers they need or to solve their problems. Those are the keyword phrases that you will use on your website so they will find your school. You will use the targeted keywords on your website, social media posts, emails, landing pages, and content downloads. Start with a list of 100 or so relevant keywords. Those keywords will NOT be the name of your school or your programs. Use keywords and phrases related to the interests you have identified in their personas. Your content should provide information about those interests and topics. If you aren’t sure, ask your existing students’ parents what information they used, or could have used, when they were deciding on the right school for their child. Now, begin to create informative content that provides answers to problems your ideal customers need. Help them become knowledgeable. Remember, your content shouldn’t be about you, but about the customer’s needs. You want to position your school as the experts to do that, but not by a hard sales pitch. Use stories, examples, and valuable tips to help them see your school as a possible match, or provide them with information that lets them form that opinion through your content. You are providing this helpful information in exchange for their contact information. You are using the keyword strategy we discussed above to uncover and create interesting and useful content ideas. You’ll use these keywords in blog titles, meta-tags, collateral, and content downloads. As part of your inbound marketing plan, you’ll calendar a regular schedule to create additional content. Need some more marketing ideas? Check out our 51 Ways to Market Your School blog. You’re halfway there. 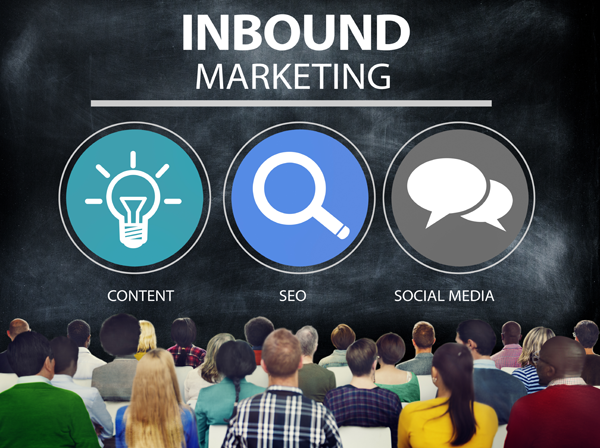 You have a basic understanding of what inbound marketing is and why it matters for every educational institution. But keep reading and learn about the rest of the process in Part 2 of Inbound Marketing for Schools. Or, if you'd like to get more information about what it takes to begin a marketing plan for your school's inbound marketing, just complete our Inbound Marketing Assessment Form today!